Why Busing Didn't End School Segregation : NPR Ed A 50-year-old program in Boston buses students of color from the city into more affluent, mostly white suburbs. But why didn't other places adopt this system of desegregation? Oak Hill Middle School students say goodbye to METCO students heading back to Boston on the bus. 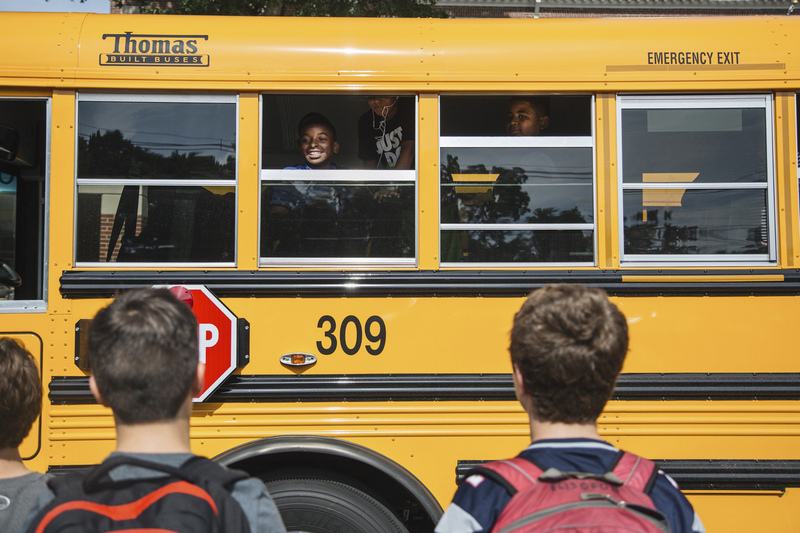 America's desegregation era is long gone, but one voluntary school busing program in Boston has persisted for nearly 50 years. The program is known as METCO — the Metropolitan Council for Educational Opportunity — and buses students of color from the city into more affluent, mostly white suburbs for school. I know the program because I did it in the '80s — traveling nearly an hour back and forth between home and school every day. I recently returned to Boston to check in on the program and traveled on that same route with Bryan Bailey, a 13-year-old who goes to school in Newton, Mass. Bryan is one of nearly 3,300 students this year that participate in the state-funded, 18 million dollar program that pays out roughly 5,000 dollars per kid to the suburban towns that take part. But between high housing prices and restrictive zoning policies, there are suburbs in the program that look a lot like they did back when the program started: majority white. And when it comes to efforts to desegregate public schools nationwide, the long-running METCO program is more of a quirk in history than the norm. School desegregation faded as a political priority in the '80s and '90s. Today, there are growing numbers of racially and economically isolated schools in the U.S., meaning the ideal of integrated classrooms is still effectively out of reach. But while integration is still a process, METCO has made a big difference in education. The most recent research of the program shows that nearly 90 percent of METCO's black and Latino students graduate from high school on time, and they score higher on state achievement tests than their peers in Boston Public Schools. So if a program like METCO has been seen as a success when it comes to educating kids and closing the achievement gap for kids of color, what happened? Why didn't it spread? I talked with Matthew Delmont, a history professor at Arizona State University who has literally written the book on why busing failed to integrate schools in America. So why did busing fail? A couple things happen that make it difficult to sustain busing programs into the '80s and '90s. One is the tremendous amount of white flight that happens in cities like Boston, so there just simply aren't enough white students to go around to have meaningful school desegregation. This is true in Chicago, in Los Angeles, in New York. The other thing that happens is busing placed a tremendous burden on black students and on students of color. In most cases, they were the ones that were asked to travel to the suburbs, travel sometimes to hostile neighborhoods. For many parents, that simply isn't worth it after a number of years. If not busing, what were the other ways that schools tried to desegregate in modern times? There were a couple of popular plans. One would be magnet schools — trying to funnel resources into schools primarily in communities of color that would attract white students back to those schools. Those have received different amounts of success in different communities, but it's been a program that has some merit and has been popular for good reason. Another would be to simply redraw zoning lines. I think one of the reasons that busing got so much attention is that it seemed very inconvenient. They're talking about busing kids a half-hour out of the city. In many communities, if you simply redraw the zoning lines you can accomplish school desegregation. It's still tremendously controversial, but it can still produce meaningful school integration in places that have tried it. For schools that have tried rezoning, taking race into account has led to trouble with the law. Exactly — there are two issues. One, the Supreme Court has consistently handed down decisions that say that race can't be the primary factor in drawing these school zoning lines. The court does not want to see race be the deciding factor in these school desegregation issues. The other factor is simply a matter of political will and how much white parents will go for it. Unfortunately, it's the case that across the country, white parents simply don't want to send their kids to schools with large numbers of African-American or Latino students — even if they consider themselves to be liberal in theory, or in the abstract, they are in favor of integration. When push comes to shove ... they oppose any sort of meaningful school integration. Can you elaborate? What does that mean and what does that look like? I think one of the challenges of what the Obama Administration is proposing is the voluntary aspect. I think voluntary is great, but the number of school districts that are willing to take this on? I think the Century Foundation has been doing some research on this. It's something like 1 percent of school districts in the country are attempting these programs. I don't think that's going to scale much beyond 5 percent or 10 percent unless there is real political will put behind it. I think it's great to offer some cash incentives and encourage people to take this on voluntarily. But the history of the last five decades is that school districts simply won't do this voluntarily and that if we want to see meaningful school desegregation — whether that is in terms of socioeconomic status or race — it has to be encouraged strongly.